This recipe was adapted from a ginger cake recipe in one of my favorite cookbooks, The Back in the Day Bakery Cookbook by Cheryl and Griff Day. Every recipe so far has been unbelievable! And although it is not an ingredient in thsi particular recipe, it was Cheryl and Griff who made me a lover of cardamon. 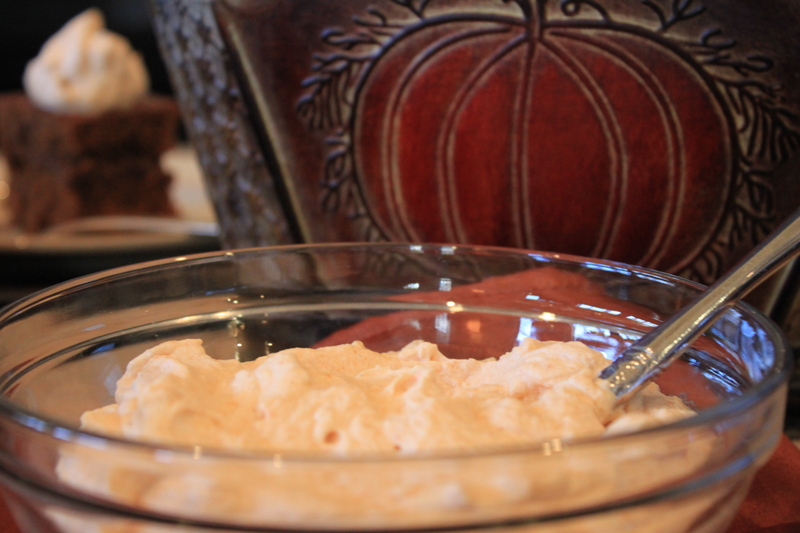 Topped with the perfect pumpkin whipped cream, this makes a wonderful addition to your holiday table or any time of the year for that matter! Position your oven rack to the bottom third of your oven and preheat to 350 degrees. Spray an 8 x 8 x 2-inch baking pan with non-stick cooking spray. Bring 1 cup of water to a boil. Add 6 pieces of crystallized or candied ginger. Cover and let steep while you prepare the rest of the recipe. In a medium bowl whisk together, the sugar, butter, molasses and egg and set aside. In a large bowl, sift together flour, baking soda, cinnamon, nutmeg, cloves and allspice. Add kosher salt and stir. Add your wet ingredients to the dry and mix just until combined. Carefully remove the candied or crystallized ginger from the hot water and dice. Pour hot ginger water and add diced ginger and stir until combined. Bake for 35 minutes or until a toothpick inserted into the center comes out clean. In a chilled mixing bowl, beat together cream, sugar, vanilla and cinnamon. Once you reach a whipped cream consistency fold in your pumpkin puree. Wait until your cake has cooled so that your pumpkin whipped cream does not melt. Cut cake into large squares and place a dollop of pumpkin cream on top. You can sprinkle a little cinnamon on top. Enjoy! 2 Comments on "Ginger Cake Squares"
Loved, loved the ginger cake and now I can make my own!! Thank you so much for the treat. It was such a delightful experience to meet you yesterday at The Matthew House. My turkey is in the oven now…it smells wonderful. Hope yours does too Happy Thanksgiving!!! Hi Sheila! Welcome to my second home! : ) I am so very happy you all enjoyed the ginger cake. As you can see, it is super easy to make! All of the food was absolutely wonderful and so well prepared. It was flavorful, perfectly seasoned and apparent that it was most certainly made with love. I am currently make a cranberry parfait using the delicious cranberry relish made at The Matthews House. Be sure to watch later this evening for the post! Thank you again so much! xo It was most definitely a blessing to our family! THANK YOU! !